Lee Ann’s latest recording is now available on Audible. 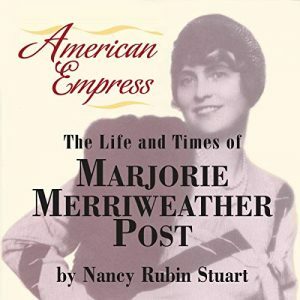 American Empress: The Life and Times of Marjorie Merriweather Post by Nancy Rubin Stuart is a biography of the Post cereal heiress and philanthropist. During the nearly nine decades of her life, the beautiful and vastly wealthy Mrs. Post had four husbands – among them stockbroker E.F. Hutton and Joseph Davies, ambassador to Soviet Russia under Stalin – built several glittering mansions, including Palm Beach’s legendary Mar-a-Lago, and sailed the seven seas on her huge yacht, the Sea Cloud. A sweeping social history about one of America’s most beautiful, wealthy, and generous heiresses, the “Duchess of Washington, DC” and the “Queen of Palm Beach”, a friend to the crowned heads of Europe as well as to American presidents, first ladies, senators, and diplomats. The daughter of breakfast-cereal magnate C.W. Post, Marjorie Post’s story traces her rise from her middle-class Midwestern roots to the pinnacle of America’s high society. Along the way she married four times, anonymously gave thousands of dollars to widows, students, and soldiers, and earned the respect of hundreds of people for her charity, wit, and charm. To listen to the sample and/or purchase the book, head to Audible here. Posted by lahowlett on February 7, 2019 in Uncategorized and tagged Audible, audiobooks, biography, Marjorie Merriweather Post, Nancy Rubin Stuart, nonfiction, Post cereal.